“We couldn’t have dreamed of a more beautiful and romantic honeymoon." The White Elephant at Jendela di Bali is a unique private villa hidden away in the foothills near Ubud that offers the ultimate in romance, seclusion and lifetime memories. This experience will deliver you from the tourist throng and offers you a window onto an ancient culture, filled with love, created with care and blessed with enchanting authenticity. Why the 'White Elephant'? Yes, they do really exist and they are highly revered in all Asian cultures. The Jendela di Bali estate is like a 'village' of unique living spaces including a lounge/dining bale, a media entertainment/massage/meditation bale, The White Elephant romantic guest bedroom bale and a pool house with a stunning wet edge pool, all set in over 2200sqm of tropical parkland gardens on the edge of a jungle gorge. * You will have the exclusive use of the whole villa estate and pool. Jendela di Bali as a unique 'village' of living spaces, each artfully hand crafted to reflect traditional Balinese and Indonesian-archipelago architectural styles. Each 'bale' is set within verdant tropical parkland gardens with fountains, flowers and vibrant bird life. You will have the exclusive use of the whole villa, whether you book one or both bedroom bales. This is a dream space like no other, designed for honeymooners. Lie in the elegantly-dressed king bed looking out the stunning glass wall to the moon as it hovers languidly, whilst fireflies dance in the forest before you. 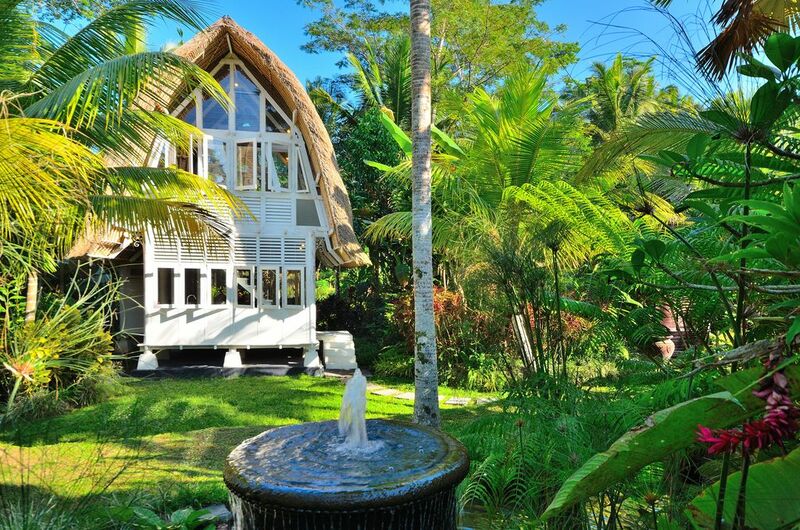 Inspired by the traditional Balinese rice barn, over three levels The White Elephant offers a living room, undercover deck with daybed, largely enclosed bathroom opening onto the deck and upstairs is a romantic bedroom and loft on the third level. Each level with ceiling fans. You can dine beside the black volcano stone pool with its wet/infinity edge, recline on the wonderful day bed or relax in the armchairs made from upcycled former Balinese fishing boats, there is a space and place for you poolside at Jendela di Bali. There is even a hammock strung between a circle of palm trees to settle into and read and relax. Jendela di Bali estate lies alongside an ancient gorge several stories deep. This natural amphitheater forms a protective habitat for plants and wildlife. Our villa gardens extend this natural habitat by a further 2200 sqm's, providing ponds and fountains for the enjoyment of birds, butterflies and guests alike. We offer ALL meals (Breakfast is included in the rate and a menu offers Lunch & Dinner selections at a modest additional cost). For details please click the 'Contact Manager' link and request a copy of the menu and we'll email it to you. CAR + DRIVER - Whilst staying you may want to visit some of the many fascinating religious, cultural and natural sites near the villa and you will also want to go into Ubud for shopping, cultural performances, etc. At any time during your stay you will have the option to book a car + driver at a reasonable rate with 24 hours notice by telling the villa staff who will liaise with our office. The White Elephant bale has a unique bathroom. Please see more images and details on jendeladibali.com to ensure it will meet your needs. THE WHITE ELEPHANT BALE - A bathroom open to the deck: offers a shower-over-bath (privacy via modesty curtains to deck, shower curtain), ensuite (toilet, basin) in alcove. There is a second full bathroom in the Bale Bengong and a powder room in the Wayang Kulit media bale. For local landline and mobile calls. WiFi is generally sufficient to enable Skype if you bring your computer. Our beautiful staff lovingly prepare a menu of delicious Balinese and Indonesian-inspired meals. Breakfast is included in the rate, other meals additional please ask for a copy of our menu. Our beautiful staff lovingly prepare a menu of delicious Balinese and Indonesian-inspired meals for guests. We also love to prepare romantic dinner settings for honeymooners! Unfortunately the undulating ground, steps, changing levels and stepping stones make this inappropriate for wheelchair accessibility or the elderly. Exclusively for your private enjoyment! 7m X 5m, wet-edge black volcanic stone pool, 1.4m deep, sun lounges and covered adjacent pool house open bale with daybed and chairs. You will have the exclusive use of the whole villa estate. Only one guest booking at a time gets the whole estate all to themselves. Daily Menu - our beautiful staff lovingly prepare a menu of simple but delicious Balinese and Indonesian-inspired meals for guests. Unlike many villas, we can offer all meals (breakfast is included in the rate and a menu offers lunch and dinner selections at a modest additional cost). We understand your desire to enjoy local flavours adjusted to western taste as well as the importance of quality and cleanliness in the fresh foods we present. We can cater in a modest and understanding way to special dietary needs, including gluten free and vegetarian cuisine with advance notice. For a copy of our menu please click the 'Contact Manager' link and request a copy and we'll send it to you. For a guide to all the Sacred Sites, Attractions and Activities please click the 'Contact Manager' link and request a copy and we'll send it to you.